I'm pretty much ready to go except for those little last minutes things (like throwing my toothbrush in the bag). I'll leave early in the morning for Carol's place and from there we hit the road for Bead and Button. I'll try to check in during the week and maybe even put some pictures up for you. I know, it will be nothing like being there but I'll do what I can to bring you along in spirit. If I could, I'd stash you all in my bags and take you along. Alas, that just won't be possible because you won't all fit in my one suitcase (I had to have room for my beading projects!). There was just a moment this morning. There was just a little moment of panic, but it has passed. I have actually achieved quite a bit, even after procrastinating. T-man has said for years that I work best under pressure. Giving myself deadlines is just not the same as those imposed by others. So circumstances stepped in this morning and results have been achieved. Then I had a little panic about packing. After I made my list I realized that I just don't have that much to pack! Carol, however, is packing like a mad woman! She's the one who has to load up the goodies for Bead and Button. She will, for instance, be packing the instructions and supplies for making her lariat (designed by yours truly). Remember, we'll be in booths 746, 748 and we look forward to meeting some of you. Have a great weekend!!! Do the acronym and that is exactly my feeling right now! Where did my week go? This weekend I'll be packing for my road trip with Carol to the Bead and Button show. Yes, we are driving. It would cost an arm and a leg and a kidney for Carol to ship all that glass, so we are hauling it up there ourselves. Actually, I love road trips. There is always so much to see along the way. And yes, I plan to take a camera. So I'm off to get things rolling. More tomorrow. Bead on! Carol and I leave for Milwaukee on Monday! I cannot believe it's that close. I better make a list of things that need to get done so I don't forget anything. I'll try to take the computer and hopefully I'll be able to type a little each evening. Actually, I'm hoping we are so busy that we barely have the energy to fall into bed each night and drag ourselves out again the next day. I really, really want Carol to go home with a MUCH lighter load (and not just because it's less to pack up). As for the jewelry, I'm going to attempt to finish a necklace I've started, but I'm not sure there will be anything else I can get finished before we start selling. The earrings have garnered lots of compliments when I have worn them. I absolutely love the ones made with the vintage Chanel chain (tease, tease, tease). By the way, we will be in booths 746,748. Look for Jeweled Treasures on your program. Thunderstorms are getting closer. Of course it is raining in Austin, which is where I'm headed this afternoon. Bah! It figures. Oh well, I don't melt -- I must be a good witch, huh? Later, beadlings! First there is the necklace made from goodies from Carol, modeled by my darling Natalie. Just so we are clear, I don't do wire and chain work. This is made with a Vintaj bronze hook and ring clasp, two types of bronze chain, 20g wire in vintage bronze (wire wraps by yours truly), some beautiful glass rose beads (she has these in several colors!) and a flower which adorned a bracelet in a previous life (there are quite a few of these in the booth). She even has all the tools you need to create your own wearable work of art. I'll be wearing this next week at the Bead and Button show. I'm making another pair of earrings today (in addition to two pair I have already made -- pictures next week) and I'll lay out another necklace to be put together this weekend. This picture was taken by Clara back in March. Yuck. That is NOT me. That woman CANNOT be me. Then we went looking at bridesmaid dresses Wednesday and Natalie shows me what she wants me to wear at the big celebration next year. Oooookaaaaay. Hmm. Add to all this a visit with the doctor yesterday and changes are going to be made. I found these Ezine articles, which I absolutely love. You would not believe what a difference it has made to just tell myself that this is going to be done and it can be done. I feel like the Not-So-Little Engine That Could. So, you'll get a new picture of me every month. What did T-man say? He said "Good. I can't wait until we can get back to doing things we used to love to do." Crap. He had that "let's go rock climbing" look in his eye. Do you think it's like riding a bicycle? And bicycles! He wants to ride bicycles! 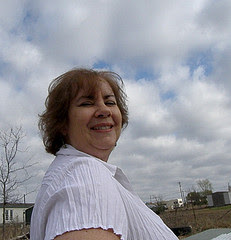 So, here I go getting back down to my fighting weight and I have until November 2010, if not sooner. And no, I won't tell you how much needs to come off. You'll just have to check the pictures each month. And you know how I love moral support, so lay it on me! And I hear you over there, wanting to know what miracle I found. Nope, no miracle and I'm not deluding myself into thinking this is going to be easy. It's going to be a lot of hard work and a totally different way of thinking. It's apparently a holiday weekend (my days just run together, you know) so I want you all to have a nice, relaxing time and be safe! Oh, and work in some beading while you're at it! 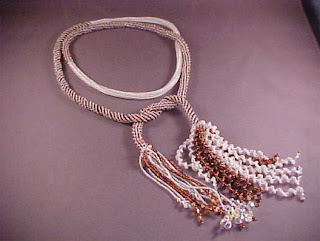 I just love lariats and simple elegance. Don't you? Teal, sage and champagne with raw brass ~ yum! That is because on Monday I usually do things that usually are NOT actual beading per se. Today there are more things to photograph, things to type, things to email, things to mail, things to update. In other words, it's not very creative but it is very necessary. I worked up a necklace, a pair of earrings and a bracelet (the bracelet is for Ariel) this weekend, all using goodies from Carol's inventory. I plan to be pretty much a walking advertisement when we go to Bead and Button in a couple of weeks. Hopefully some of the pieces will stand out enough to draw lots of attention, as much as I hate drawing attention to myself. ~yuck~ I'll try to get some photos up here later. They were not stitched pieces, rather they were strung or wire worked pieces which, as most of you know, are things I only occasionally do. I've also got new links to add to the blog this week. I found several more creative/artsy/jewelry type sites to share, and don't forget to check the Giveaways! I have it on good authority that there are some new goodies up for grabs. So have a good Monday Morning, a Blue Monday, a Monday Monday, a Stormy Monday, or just another Manic Monday because It Sure Is Monday. The happy parents-to-be. 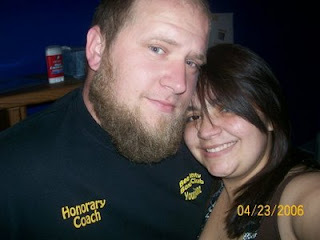 That's my beautiful daughter and her sweet fiancé. Well, that last hint did it. One Sheep gets the prize. Copper Penny is on it's way to me (thank you, Beverly!). I hope you enjoy your new beads as much as I'm going to enjoy mine. Hey, this was fun. I'll have to do this again. Guess I better check out all of my giveaway links. Bwahahahahaha! Thank you all so much for playing. I really did have fun and the guesses were great. Use those links and let me know if you win something on another site or on this one next time. I know I'll keep trying! According to my calendar, today I need to do some paperwork. It's nothing big or dire, it's just things that need to be done. I need to update the calendar some more, write a class description, update my resumé/bio, and fill out a proposal or two. It sounds like such a little bit, right? Ugh. I mess around and take my time because I hate trying to describe what we're going to do when it's so much easier for me to show you, I hate tooting my own horn, and class proposals bring out all of my insecurities. Speaking of insecurities, I did two small paintings this week. Of course, my family sings their praises and I don't even have to pay them to do so! The first one was getting used to the canvas and paints. It looks like it was done by a five-year-old. The second is okay. After paperwork today, I'm going to try sketching out a design for the next one. Why am I painting? A friend talked me into doing paintings for her apartment models after she found out that I like to play with paints and I said yes. The canvas that frightens me is the 36"x36", although I have definite idea of what is going on it. Let's just say I am a hack and leave it at that. But hey, I'm sitting here watching a guy make a pineapple in a shadow box using duct tape, a glue gun, caulk, and paint, using a pencil to texture the paint. It actually looked like a pineapple when he finished. Obviously, I am not pushing myself enough. I also made two pair of earrings this weekend, which just goes to show what happens when I'm intently procrastinating. But according to the calendar, photo day is Friday this week. And yes, I've got something specific scheduled for every day this week. Now on the Pay It Forward Prize Front, you are still not there. However, someone is very, VERY close. T-man says I'm being too vague in my hints. Well, it's not a palette I use very often, it's not the colors in the prize package, and it is pretty much a brand new crayon in my box. Even if you have already guessed, give it another go. Here is a BIG hint: look at my Etsy store for a clue. 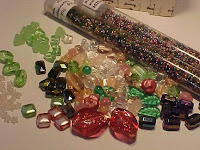 Art Bead Scene Studio Saturdays offers a weekly giveaway. All you need to do is leave a comment and hope yours is the one randomly drawn. I have won beads from these ladies and let me tell you, they are giving away some beauties! Give it a whirl. Craft Gossip also has regular giveaways of all sorts. You have to check on a regular basis to see what's up for grabs. 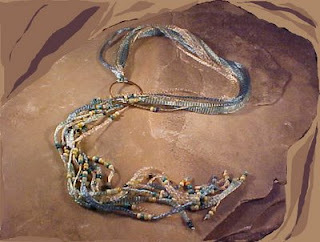 Beaded Zen Designs has Free Jewelry Wednesdays! There are rules, but they're pretty easy to follow. And Nicolette Tallmadge has monthly giveaways. Sorta Flowering Designs has a monthly give-away. Simply sign up for their newsletter to be entered (click on "About"). Kristi at Coliebug Beads also has a monthly giveaway. She's a sweetheart! Lorelei is having another giveaway. All you have to do is comment, then commit and follow through if you win. And Bead Happily Ever After has regular giveaways. Be sure to follow the rules! My beady friend Carol Dean Sharpe is giving away a bracelet simply for coming up with a good name for her new series of work. You will receive two 30g tubes of size 11° seed bead mixes (some of the last of the Bumble Beads stash), some teeny rose quartz stars, some green pyramids, vintage pearlized glass, a pair of vintage Venitian glass swirly beads in a fab rosy pink, Czech iris beads and a pressed glass mix called Spring Fling. You also receive a little post-it note book, made by yours truly, for jotting down ideas and inspirations. All you have to do is correctly guess which bead soup I chose as my prize from Beverly. Well, that should get you started on your new giveaway addition. Just call me your enabler, after all I am experienced in that sort of thing. Happy hunting! I won beads! Yep, I won some beads from Beverly Gilbert. Woo hoo! 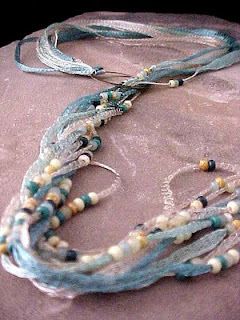 Go take a look at her bead soup collection and see if you can guess which one I've chosen. So I'm going to pay my good fortune forward. In honor of being added to Beverly's list of winners due to my geekiness, I'm going to come up with a prize for the person who guesses which soup I've chosen. I promise it will be something nifty. I will post pictures of the prize tomorrow, but feel free to start posting in your guesses now. Almost forgot -- the deadline for your guess is next Wednesday, the 13th. I'll tell you who the winner is on Friday, the 15th. Well, Carol and I were VERY busy this weekend. There was a fairly good crowd at the bead show if you factor in the economy, the fears of H1N1 flu, and all of the other things going on around San Antonio. We were busy in waves, which is always good -- it gives us time to pull out more goodies from under the tables. Carol has a never ending supply of gorgeous beady things. I got to see many, many good friends. Pam was indeed there with her yummy beads. If you got any with drool on them, it's my fault. I got to have dinner with my favorite girls, then back to Cat's for bead show Show and Tell. It's always fun to see what got scooped up. Juls outdid herself this time and she didn't buy much purple. Cat has totally climbed out of her box and came home with a stash of orange. And Clara scored some great lampwork flowers that are to die for. Me? 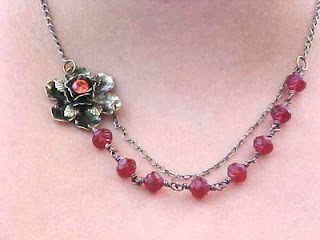 I got wire working tools this time, and projects to make to wear to the Bead and Button show. I need to show off Carol's goodies. We have a month to prepare for B&B. I was available this year to go with Carol. I've never been before, and it may be just a bit overwhelming. I guess we'll just have to wait and see. On the upside, I may get to meet a few of my cyber friends while I'm there, and there will be all of those beads spread out before me . 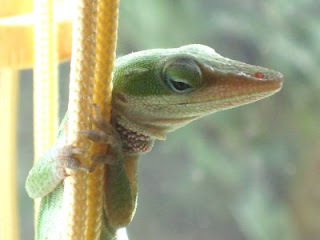 . .
Today I'm just kind of taking it easy. I'm a little sore and a lot tired, so I'm pretty much being a couch tater with Bella at my side, which she has not left since I walked in the door last night). I might pick up the beads or I might just nap. Either way, tomorrow I'll be back to work with my shiny bits of glass. First, the BIG news -- Natalie is having twins! Yep, TWINS!! We're still waiting for that news to sink in. Second, I made a new front page. My Coral Reef bracelet is on the front page of My Handmade Registry. You can go make a registry for things you want for whatever occasion. Pretty cool. Thanks, Dorana! And finally, this weekend I'll be in San Antonio at the San Antonio Bead and Ornament Society's Spring Bead Bazaar, and I will again be helping the lovely Carol Wille. Remember, there will be beads, beads, some beads, a few beads, and I believe beads. Try to come find us to say "hi"!